As many as 452 rembuk RW consultants will undergo a training held by North Jakarta Administration, starting tomorrow until December 18, 2018 at the mayor office's Fatahillah Room.
" 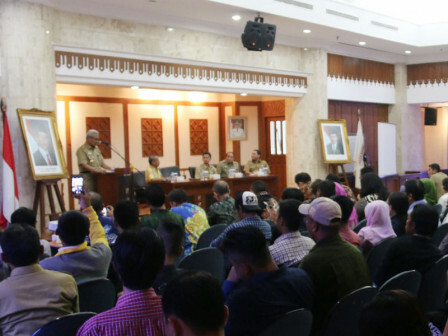 These participants are the result of a consultant recruitment selection held last November"
North Jakarta Mayor, Syamsudin Lologau expressed that it is a series of stages in the preparation of the RKPD in 2020. It is expected that those consultants will improve the quality of proposals in the rembuk RW. It is to improve the ability of the community to identify issues, develop needs and determine activities to solve issues based on a priority sequence agreed upon in the RW," he expressed, Monday (12/10). It is very important, as the results will affect the quality of the process at every level of the stages of the Musrenbang in 2019. That is why he urges the trainer to share material that is informative, easy to understand, factual and interesting. As for all participants are expected could take part in the training with enthusiasm, responsibility and critical. "The success of this training can be seen from the increase in the quality of proposals based on the community's priority needs by meeting the applicable provisions and mechanisms," he added. M. Arief, Head of North Jakarta City Development Planning Sub-Agency explained that it purposes to share understanding of the tasks and functions of the Rembuk RW consultants, as well as participatory facilitating techniques, techniques for extracting people's aspirations, rembuk RW consultation facilitation techniques and assisting the process of rembuk RW results. Its training involves 21 trainers and 452 participants who are representatives of residents in every neighborhood of RW in North Jakarta. "These participants are the result of a consultant recruitment selection held last November," he stated.